Honey is a source of carbohydrates-- mainly fructose (about 38.5 percent) and glucose (about 31.0 percent). The remaining carbohydrates include maltose, sucrose and other complex carbohydrates. On average, honey is 17.1 percent water. 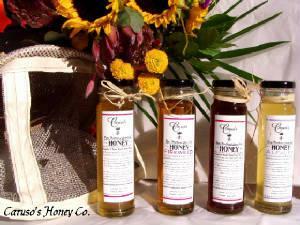 Honey is naturally fat free, cholesterol free and sodium free. Honey also contains several compounds which function as antioxidants-- compounds that may help delay the oxidative damage to cells or tissues in our bodies. Known antioxidants compounds in honey are chrysin, pinobanksin, vitamin C, catalase and pinocebrin (which is only found in honey). The above information was obtained from the National Honey Board. Want more information or facts on Honey Click here to go to National Honey Board Website.